What are the Rules for Pickleball? Pickleball is a sport that borrows elements from both tennis and ping-pong and turns them into their own unique sport. The combination of familiar elements from other sports, combined with the specialized equipment for pickleball, have made an exciting new sport that has taken off around the country. Pickleball can be played on any tennis court, or on specially made courts that follow the dimensions for a pickleball court. When using a tennis court, it is important to make sure that the court is twenty feet by forty-four feet total in length, and that there is an area that takes up seven feet on both sides of the net. The net itself should be hung at thirty-six inches, with the center at thirty-four inches. For more info on nets, check out our review of the best pickleball nets. In order to play, there are specialized pickleball paddles that are easier to play with due to their box-like shape, but in a pinch normal ping-pong paddles can be used as a temporary solution. Or, you can grab a good pickleball equipment set that has everything you need for a game. Making sure that you are playing with the correct size court is crucial when starting out playing pickleball, as playing on a court that is too large can lead to issues maintaining a volley and successfully serving the ball with the limited force provided by the pickleball paddles. You can play pickleball in pairs (doubles) or one vs. one (singles), and the rules for each are almost identical. Much like tennis, each team is set on opposite sides of the net, with the intention of causing the other team to commit a fault, such as hitting a ball out of bounds or causing a double bounce on the same side of the court. However, unlike tennis, pickleball has a longer list of “faults” than tennis or ping-pong. Faults can include not hitting the serve in a diagonal pattern, not hitting the ball over the net (as in cases where the ball is hit but instead hits the net instead of clearing the distance into the other player’s zone), as well as other various violations that can result in the serving team gaining a point. The wide variety of faults presented in pickleball allow for more interesting changes in server and make it somewhat easier to score points in the long run. Unlike tennis or ping-pong, pickleball tends to not maintain a volley for an incredibly long time due to the allowance for the ball to bounce between being returned. One aspect of the rules that is fairly unique to pickleball, only the serving player or players in pickleball are in a position to gain a point due to a fault by the other side. If the serving team commits a fault, they then lose their chance to gain a point that serve and the serving preference changes to the other team. If the score is even, the server for the first team stays in the right side of the court, while when the score is odd they switch to be in the left side of the court, allowing for some variation between positions during game play. Here are some of the general rules of pickleball in more detail, such as the unique double bounce rule, as well as variations provided for tournament use. One of the key rules in pickleball is the fault rule. In the case of a fault committed by the opposing team to the serving team, the serving team gains a point, putting them one step closer to winning the match. If the fault is committed by the serving team, they lose their chance to gain a point that serve and the serve switches to the opposing team. Faults include not serving the ball diagonally, not hitting underhand during the serve, not passing the net while serving, hitting the ball out of bounds or not hitting before a secondary bounce, or volleying the ball in the area between the net and the rest of the court. This seven-foot area is known as the “kitchen,” and acts as a no-volley zone to prevent spiking for safety reasons during play. A major rule in pickleball is the double bounce rule. When a ball is being served from one court to another, it must bounce once before the opposing team can hit it back. After this, it must be allowed to bounce once before being served back to the opposing team. This must be done before starting a volley, and if these instructions are not followed, a serve that is not allowed to double bounce is counted as a fault. This is mainly done in attempt to reduce the unfair advantage that first serve players would have during a tournament, as well as to prevent injury or serve spiking. In order to serve the ball, the player must hit the ball with the pickleball paddle underhanded, as over handed and side serves are not accepted due to the potential for injuring other players. While pickleball can be a fast-paced and competitive game, it is specifically geared towards not causing injury or harm to other players, either during a server or during volley in general. One of the more confusing rules of pickleball applies to the play area known as the kitchen, or no volley zone. This seven-foot area on either side of the net acts as a precaution against spikes and more aggressive serves against the other team, as it does not allow someone to hit the ball without it first bouncing within the area. Players may stand in the kitchen area in order to hit back and already bounced ball. However, if they return a ball that has been volleyed without allowing it to first bounce in the kitchen, they are at fault and could end up giving the other team a point. This rule is largely in place due to a similar technique that is used in volleyball, where getting close to the net and spiking it at the opposing team can cause both frustration and injury. The kitchen in pickleball allows for a moderately paced game without causing issues due to aggressive serving techniques. In the case of a singles game, the rotation of servers happens when a fault is committed. Depending on what the score is for the game, the server may either be in the right or left side of the court serving diagonally to the opposing side. However, the rules become slightly more complicated when playing with doubles, or during tournaments. Because of that, there are different pickleball strategies employed in singles and doubles play. When playing with doubles, serve starts to the right and switches depending on the score present. Unlike with the rules for playing singles, both players in doubles usually stay in their respective spot during the serve rotation, and the serve itself switches back and forth between left and right sides of the court. At any point during a pickleball game, a team switch can be called, causing the two different sides to switch player orientation on the court. This is done to ensure fairness throughout the entire game. During a doubles pickleball game, it is important to make sure that you are serving to the opponent that is diagonal towards you, as a straight serve counts as a fault and will cause the serve to change to the other players side. It is important to note that in pickleball there is only one attempt at a serve. If this serve is not underhanded, it counts as a fault and the serve will switch to the other team. A casual pickleball game will usually go to either eight or eleven points, with a team needing to be ahead by two points in order to win. In the case that both players reach eleven points without either team holding a two-point lead, the game continues until one team succeeds at holding this lead. In tournament games, the point range can go from either fifteen to twenty-one, but still maintains the need to win by 2 points. Interestingly enough, unlike tennis, since pickleball only allows scoring when the players are serving, maintaining a lead by two points is more difficult, as players must prevent the serving team from scoring a point before being allowed to score their own point. This means that four serve cycles must go by at the very least in order to provide two points for one team. 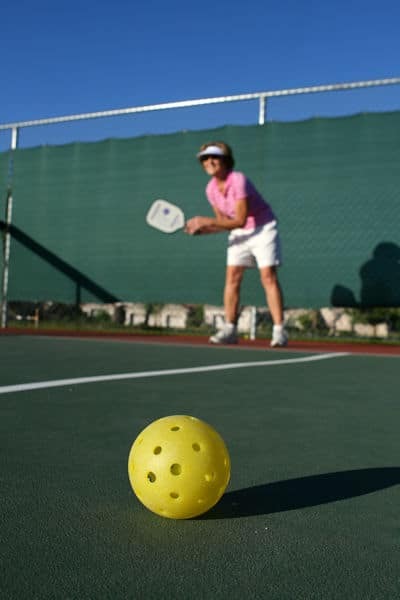 Unlike tennis, in pickleball, if a ball hits any portion of a volley line, either during serve or while in play, it is considered still legal and does not count as a fault. In the case of a served ball hitting a non volley line, if the line between the kitchen and the rest of the court, this counts as a fault and the and the serve rotates to the opposite team. While at first glance the rules for pickleball may seem complicated, it is one of those games that once you start playing the long list of guidelines and restrictions will seem rather intuitive. Things like no volley in the kitchen, winning by two points, and switching server side during score changes, seem to flow naturally within the game once you get on the court. Pickleball is a fun game to play either casually or in a tournament setting, and, while it is not as intense as tennis, can be just as competitive and enjoyable.